You never know until you do it. Doing it is the only training for doing it. I thought I was fit before we went to Patagonia. I wasn’t. Walking on paved streets is not remotely like climbing mountains (all day). I have never eaten so much either. I used a lot of fuel. It’s refreshing to hear hikers talk about high-calorie food as a good thing. Hiking mountains means climbing up and down uneven steps all day. With weight. And the steps are often unstable. There is a reason it is classed as an endurance sport. And we were doing it light. Our packs weren’t very heavy. We stayed in hostels so we carried a lot less weight than camping backpackers. But it was still heavy enough. Don’t get me wrong, it was great. We have amazing memories and a lot of photos. The glamour shots we saw beforehand are true to life. It is that beautiful. But it’s also a normal place where people live and work amongst mountains, glaciers and lakes. Doing it does give you the glamour shot views but it also gives you the gritty parts. On the second day hike I learnt why you need boots with tractor tread. The day was beautiful. 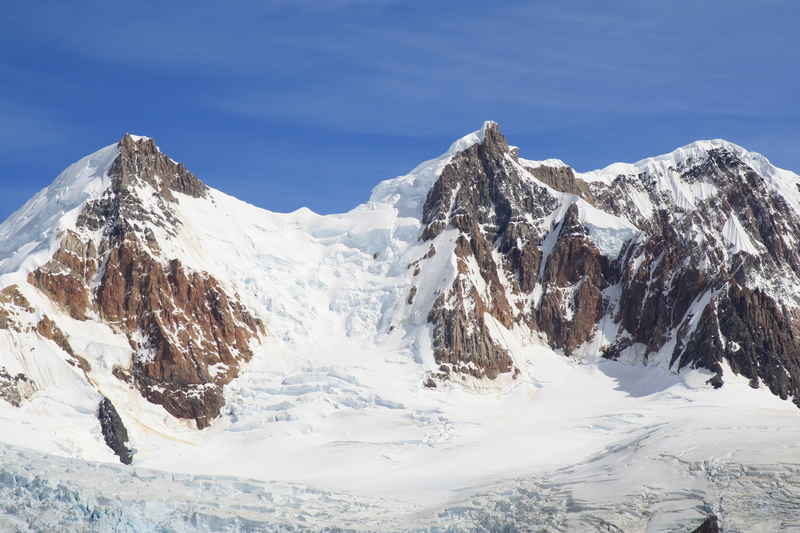 We climbed to Mt Fitzroy, a pink granite peak with a glacier and a jewelled lake. The morain (the rock wall of the glacial lake) is really high. It took hours to climb up and many more to go back down. By the time I hit flat ground again every step hurt like hell. I lagged behind and whimpered. It was beautiful and it took a lot of effort to get there and tears to get back (when no one was looking). So we finished hiking on the Argentinean side and headed to Torres del Paine in Chile. But first I bought new hiking shoes with tractor tread and reinforced toes. I admit I was scared. We were heading for a multi-day hike and I had suffered on a one day hike carrying very little. The first day was a return hike to the Torres. A long day. Up, up, up, up… down, down, down… up, up, up. And light misty rain. I ate half the fruit and nut pack designed to last for days. But I was ok, we both were. We got to the top. It was freezing and misty but there was still a view at the top. We returned exhausted. But that, we were told, was the toughest day. Well usually. The next day was billed as a”transition day”. 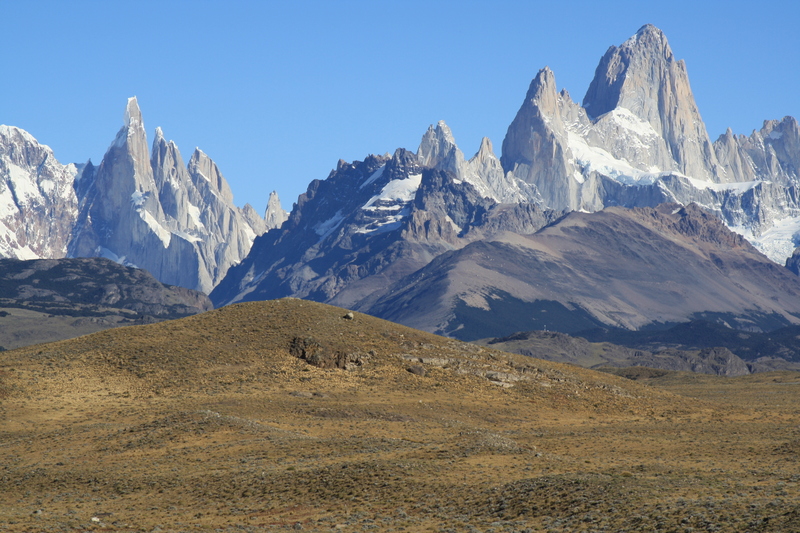 An easy hike, thirteen kilometres of “Patagonian flat” joked our guide. That means small mountains. But we had a great day. We had icy gale-force winds, then warm sun, a little of everything. We were really in Patagonia now. We walked all day with an aqua lake on one side and snow-capped peaks on the other. There were condors riding the high wind. A great day. We carried full packs and we powered on. We arrived at the hostel to discover we were staying in super-cool tent-like accommodation. Yay! And then we vomited all night. It was sub-zero with thin quilts. No one slept. Super-cool. So now we were deep into the National Park. There were no roads. We could ride horses back or walk to the next hostel. Frankly, sitting on a swaying horse with a dodgy stomach sounded harder than walking. Plus I hate to give up. So we walked all the next day, missing out on the side trip up the mountain. We walked and walked and walked and walked. And the views were still amazing. And it turns out that you can walk all day on one and a half apricot bars. It was really tough but when you have to keep going, you do. Our guide had left us to walk on ahead while he took the young Brazilian guy up the mountain. They expected to catch up to us. They didn’t. I was taking my boots off when they came in fifteen minutes later. Our guide striding in (just another day at the office) and the other guy hobbling some way behind. The last day. Well, I admit it, we didn’t walk. It was to be a double-time, march to catch the boat on time. We were very weak. So they got us an extra ferry ride and an old guy with rally car racing skills. And we ran a kilometre across a pebbled dune to catch the catamaran on time. We caught that boat and motored out to see the incredible blue glacier. There were huge blue icebergs in the grey water of the lake. How cool is that. And both our cameras ran out of batteries. We got a few shots each. Some things are meant to be experienced in the moment. So it was tough. And it was beautiful. And I want to go back. I know I can do it. But not because I have anything to prove. I just really like it there even when it’s tough. Patagonia rocks. Being in those wide landscapes felt good. Two months later and the big city still feels unnatural. Maybe because it is.